In the Navy (as well as the Marine Corps), Navy Hospital Corpsmen (HM) are Emergency Medical Technicians (EMTs). Most are nicknamed "Doc" as an informal way to address the medically trained member in your unit. Though they have more education and training than the basic EMT, they also perform duties as assistants in the prevention and treatment of disease and injury and assist health care professionals in providing medical care to Navy people and their families. Many have higher functions as clinical or specialty technicians, medical administrative personnel, and health care providers at medical treatment facilities. 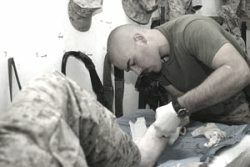 HMs also serve as battlefield corpsmen with the Marine Corps and Special Operations Units, rendering emergency medical treatment to include initial treatment in a combat environment. Qualified hospital corpsmen may be assigned the responsibility of independent duty aboard ships and submarines, Fleet Marine Force, Special Forces and Seabee units, and at isolated duty stations where no medical officer is available. Hospital corpsmen work in a variety of environments. Most HMs works indoors in hospitals or clinics. Others work aboard ships and submarines with air squadrons, special operational environments (e.g., SEAL, Recon Forces, Seabee units, and Deep-sea Diving). In the Navy, Corpsman will become Navy SEALs or Divers attending Basic Underwater Demolition/SEAL Training or Navy Dive and Salvage School to be the medical professional in those commands. To become a USMC RECON corpsman, you also have to graduate the Basic RECON Course and attend the Special Operations Combat Medic (SOCM) Course which is a 36-week program. Sailors in the HM community can expect 36-month sea tours followed by 36-month shore tours except for those with NECs that are shore-intensive. Those with operational extensive NECs can expect longer sea tour lengths. Women are assigned to most ships and field medical support units of the Fleet Marine Force (FMF). Women corpsmen are not assigned as SEALs, RECON, and other units of the FMF at this time. A-School is in Great Lakes and lasts 96 days. The school teaches basic principles and techniques of patient care and first aid procedures through group and modular instruction. After completion of "A" school, hospital corpsmen are normally assigned to Navy medical treatment facilities, although some are assigned to operational units. Advanced training in a "C" school, a tour at sea or ashore, overseas, or with the Marine Corps may follow this initial tour. The HM field has several sub-specialties in which personnel may request advanced "C" school training. Applicants must be informed that they will be assigned to duties involving direct patient care and clinical services. Male applicants must be informed that they may be assigned to the Fleet Marine Force for duty. 60-month service obligation is required. A licensed physician or dentist licensed or graduate of the medical or dental school in any country is not eligible for this rating. No history of drug abuse or commission of offenses involving alcohol, narcotics, or other controlled substances with the exception of the experimental or casual use of marijuana. Applicants must be of the highest standards as requirements are strictly adhered to before accession into the HM community. The Navy Hospital Corpsman not only care for the military members in their unit but in Navy Medical Centers, they also see dependents (wives, husbands, children) and retirees. Giving fellow service members and their families preventive and emergency health care is a calling and a profession you can be proud of doing for a career. The Navy Corpsman will also take part in relief missions, providing aid for hurricane or earthquake victims usually on board the U.S. Naval Ships Mercy and Comfort. What Are the Duties of the Navy Enlisted Electrician's Mate?